The home we explore today has an unparalleled sense of contemporary luxury. 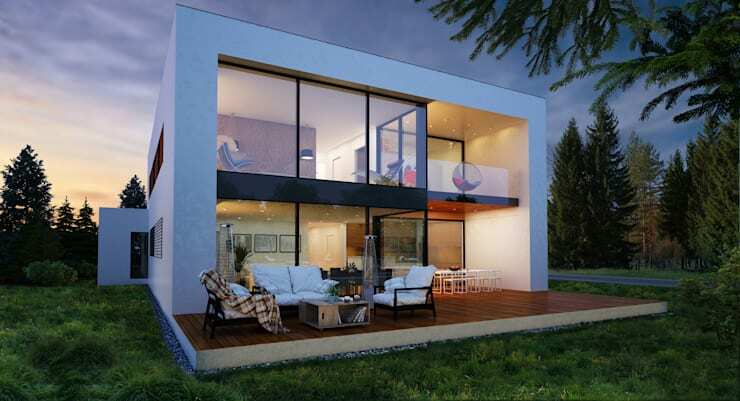 It offers vast expanses of glass, an extremely simple layout and lots of outdoor entertaining areas. It is also a cleverly designed space that would work well as a holiday home. After all, the windows and rooms all face one direction, so it's really geared to soaking up a great view! The architect is Aleksandr Zhydkov, whose impressive projects we have featured before. In this project, we recognise his signature simple aesthetics, generous expanses of glass, and sophisticated open-plan living areas. Come with us on a photo tour as we explore the finer features of this lovely home. We hope you enjoy the journey! From a slight distance, we get a sense of how the structure sits in relationship to the natural surroundings. The lack of a barrier between the terrace and garden creates a sense of openness. This is an exterior with a very strong presence that still manages to convey a sense of integration with the surroundings. It would work just as well in a beachside setting. The exterior is composed of a simple rectangle with one side made entirely from glass. It has a flat roof and the glass room is partially wrapped in a bold white shell. The generous outdoor entertaining area contains an upper-level balcony, a dining area and a casual sitting area. 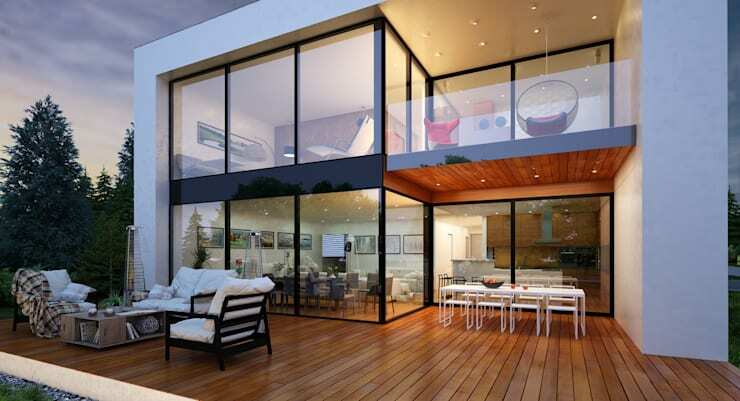 The glass walls allow for a very natural and integrated relationship between the indoor and outdoor areas. Finally, the rich timber deck adds a very warm and natural luxurious ambiance to the space. This is a home focused on the pleasures of outdoor life. So the interior is kept simple. At the same time, the orientation, luxurious materials and layout lend the interiors a real opportunity to dazzle. The combined dining and living room here has a very simple layout. 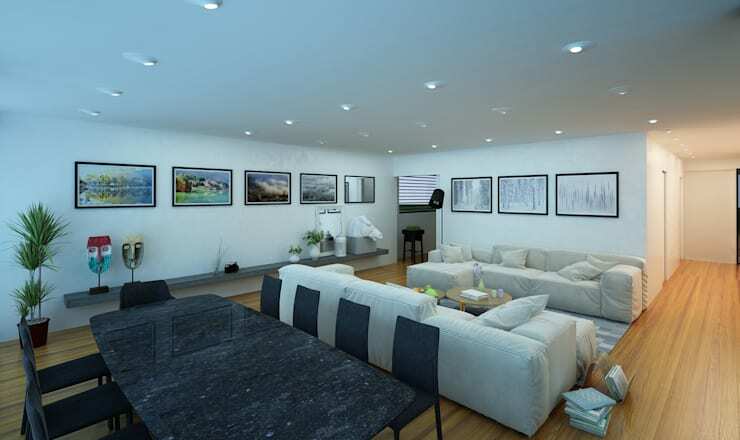 The lights are recessed and the walls and ceiling are white. But the sheer size of the space has allowed for very luxurious living quarters with fine, large and simple furnishings. The focus here is on the comfort factor and the warm wooden floorboards really shine. From the other side of the living area we can see how the timber kitchen, breakfast bar and living zones all work together. 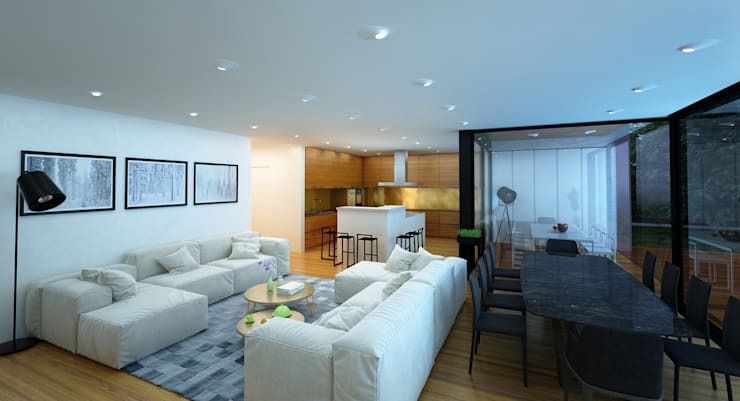 Although it is essentially an open plan layout, each area has its own distinct boundary. The kitchen has been visually defined with the timber kitchen cabinets, the living area is resplendent in white and the dining area is defined by the strong black decor. From the arrangement of chairs, we can also see how each space is really set up for socialising. 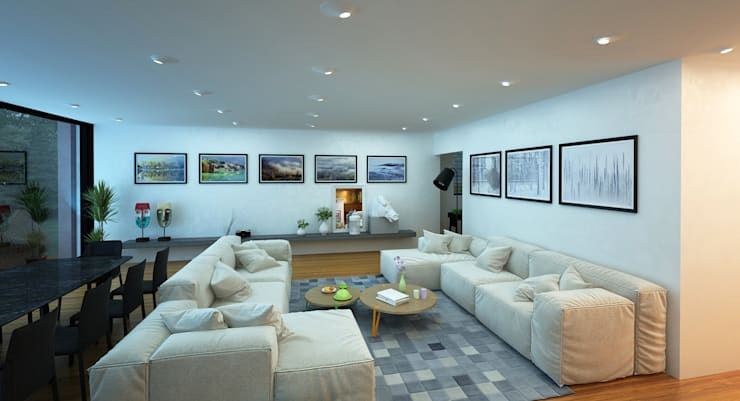 The size of the living room allows for two large modular shaped sofas. These have been set up to face each other and allow for real face-to-face engagement. The wall art is distinctive and has been hung in a strictly geometric fashion. This almost allows the semi-abstract nature of the artwork to blend into the background. It hasn't been put on display to impress, but rather to reflect the subtle colours in the furnishings. For this may be an impressive home, but it's essentially a home created for subtle, sophisticated comfort. If you'd like to see more of Aleksandr Zhydkov's dazzling projects, you'll love this Ideabook, An Inspired Glass Home. Do you like the use of glass in this house? Would you choose a contemporary holiday home? We'd love to hear! Tell us in the comments below.